I've been a fan of ILIA since trying their tinted lip conditioners more than a year ago, so I was very intrigued to hear that founder Sasha Plavsic was coming out with a slew of new products. Same commitment to good quality colour pigments and organic ingredients, same attention to packaging and presentation, but new products that could be used on the face. 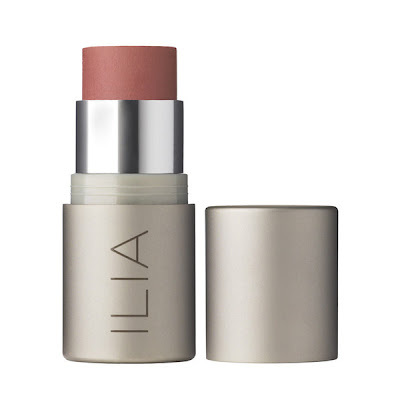 ILIA's new Multi-Stick ($34, available at Kiss & Makeup and BeautyMark) is one of those products, a versatile wunderkind that can be used on eyes, cheeks, and lips. The Multi-Stick in 'All that Jazz' is my first foray into a multi-purpose stick product and I love it. The product's flush pink hue looks great on my lips. It also provides some natural-looking colour on eyelids which, sadly, fades away quickly sans mattifying primer. My favourite way to wear the Multi-Stick is as a creme blush: the colour blends easily into cheekbones for a pretty flush that lasts all day. The product's chubby stick form--encased in ILIA's signature aluminum packaging--makes it a cinch to tote in my purse. A word to the wise though: Because the Multi-Stick dries to a powdery finish, it's not as moisturizing as ILIA's lip conditioners. Another organic brand to try -- woohoo! Thanks as always for your comprehensive reviews, Lisa.